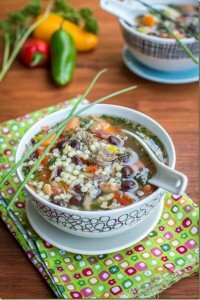 Smoky Hunter’s Soup - Let the Baking Begin! I was struggling with the name for the soup, but I think given that it has a couple of different meats, Hunter’s Soup is about right. Some time ago, my husband mentioned that he was eating out somewhere and they had a really wonderful soup with sausage. I don’t usually put sausage in the soup – to me it’s something you eat with a bun, or with a side dish, not in a soup, but it doesn’t hurt to try, does it? I used lightly smoked bacon in my meatballs and didn’t realize that a couple strips of bacon can give out such strong and nice aroma of smokiness. Also, I browned the sausage before adding it into the soup for an additional boost of flavor. Given that I used both bacon (high in fat) and sausage (not a low fat ingredient), I decided to use chicken breast as the main ingredient in the meatballs. I was a little scared that they might turn out a little dry, but the bacon and the rice did just enough to make them nice and soft. 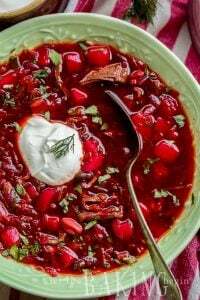 Our family really enjoyed this soup, especially my husband, he and asked for seconds and refused the main entree just so that he can have more of this soup. I guess it’s not a surprise that guys like meat, huh? 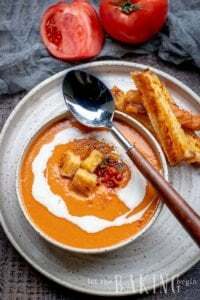 Tomato Soup – Delicious roasted tomato soup that’s smooth and silky. Slow Cooker Chicken Noodle Soup – Simple chicken noodle soup. 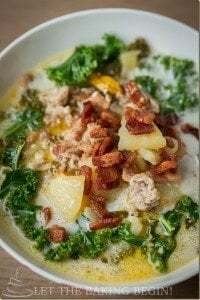 Zuppa Toscana – Olive Garden copy cat recipe. 1 tablespoon salt or to taste. Grind the chicken with bacon, add rinsed rice, salt, black pepper and garlic powder. Mix everything with your hands until the seasoning is evenly distributed (as an alternative, use your mixer with paddle attachment). With two palms of your hands form 1/2 inch balls and arrange them on a cutting board so they do not touch each other. Cover with plastic wrap and refrigerate until ready to use. Fill a pot with 2 quarts water and cook the elbow pasta according to package instructions, al dante. Drain and reserve. Peel and rinse the potatoes. Cut them in 1/2 inch cubes and rinse with water again. Fill a large pot with 4 quarts water. Drop the cubed potatoes, add the salt, bay leaf and turn the heat to high. Once the water with potatoes came to a rapid boil, start dropping the meatballs one by one, gently mixing throughout the process. When the water has returned to a boil again, turn the heat down to medium and cook until the potatoes are fork tender, about 10 minutes). Peel carrots and the onion. Dice the onion and grate the carrots. Wipe the mushrooms with a damp paper towel, cut into small cubes. On high heat, heat a skillet with 4-5 tablespoons oil, once hot add the onions and mushrooms, and sauté until slightly golden. Turn the heat down to medium, add the carrots and sauté for another 3-4 minutes covered with a lid, mixing about 3-4 times throughout the process. Tilt the skillet to the side, let all oil drip to the bottom of the tilted skillet, moving the carrots and onion to the top. Transfer the carrot/onion mixture into another bowl, leaving the oil in the skillet. Cut the sausage of choice into thin slices and brown in a skillet with leftover oil. Once the potatoes and meatballs are cooked through and soft, transfer the onion/carrot mixture, browned sausage slices, pasta and ground pepper and cayenne pepper into the pot. Gently stir. Sprinkle with parsley, gently stir again and let sit for 20 minutes for all the flavors to merge together. With a large, flat spoon, remove excess fat from the top and discard. 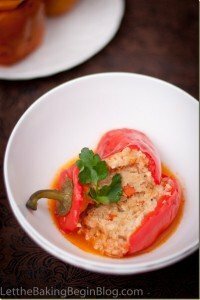 Serve with a dollop of sour cream and a hot pepper. Adjust the size of the meatballs to your liking. I like them one bite, size. They do expand a little when cooked. No for this one you grind raw chicken, this way it stays together nicely in a ball when you drop it into the boiling soup. What does “rinsed rice” mean? Is that like cooked? I was also wondering if, since I dont have a way to grind bacon with chicken, could I just chop it up and hand mix it raw into the ground chicken? Thanks! Rinsed rice, is just rice washed in water. I usually put it in a colander, then have water run through until it’s clear. Beef Polish sausage, chicken breast and bacon – all in one soup! I love it!